We value communication highly in all aspects of our life, it is how we connect and create lasting and effective relationships. It is no different when it comes to connecting the key applications and data sources within our organisations. If you are like many organisations these days, you will be looking to employ Best of Breed apps that are fit for purpose and API ready. The key is investing in the communication layer of your business, the integration platform. It allows you to expose and collaborate around vital and critical organisational data which leads to informed decision making across all levels of your business. There is no substitute for great communication. The integration layer is your organisation's interpreter. Integration is not just the responsibility of IT, it is core to the business. This is why I like to compare integration to relationships. We need to engage people at all levels of the organisation and understand how well they think their business is at getting integration right. Try the application integration assessment questions listed in the boxes below. There is normally a wonderful honeymoon period in relationships where things are new and sunny. It is not until issues and conflicts occur do you really understand the strength and compatibility of a relationship. The same applies to integrations. If you build and test your integrations based purely on sunny day scenarios, there will come the day when something unexpected occurs. Many businesses have edge or exception type cases which can create complexity and breakdowns in processes. It is important to understand and plan out how the organisation can effectively manage these processes and avoid long convoluted workarounds. If you have built a foundation of how to deal with the unexpected and unknown, the resolution process and turnaround time will help you avoid customer disappointment and set you up for success in the long term. Many great relationships start with people who share the same outlook, morals and goals. These might change over time but with consistent check ins and course corrections you ensure that the relationship will continue to move in the same direction. The same can occur in organisations where there is constant flux in strategies, application changes and industry trends. The original objectives and assumptions made need revision and assessment. With the right integration platform architecture, you can keep up with constant change by abstracting away the noise and utilising the integration layer to manage the heavy lifting. For example, if you are in an industry where there are changes outside your control such as external policies and directives, you can insert an integration layer utilising best practices which manages all the logic and translation rules. This creates a layer of abstraction from your core systems which can then receive the information in a consistent format. We constantly make decisions and actions based on information available to us at the time. We may not always make the right decision or take the right action, the key is that we learn from it and do not shy away from failure. There is an exponential amount of opportunities awaiting us once we remove the stigma of "failure". The best teams and organisation are those who master the art of constructive feedback and reflection. Remove the ego and become vulnerable. Integrations are hard and rarely built with all the use cases possible. The key is planning for failure and building in processes to provide improvements, monitoring and support. Any valuable relationship needs some TLC every now and then, integrations are no different. How do you decide which relationships are important? Everyone will have a different definition of a valuable relationship but one thing is consistent, if it is valuable to you, you will prioritise it. Integration needs to be a first class citizen. It is the application's gateway to the outside world, without integration it is just an island. 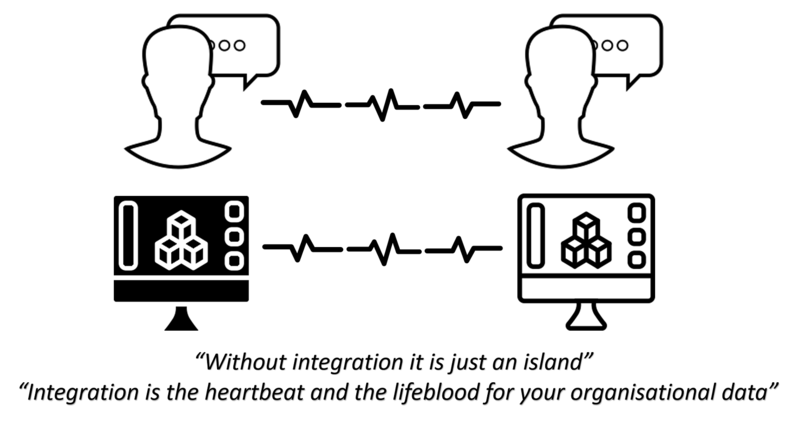 Integration is the heartbeat and the lifeblood for your organisational data. Look after your valuable data through the investment of great integration. I hope this blog has been helpful in making integration more accessible and prompted a moment to consider how the integrations in your organisation can create long lasting value.